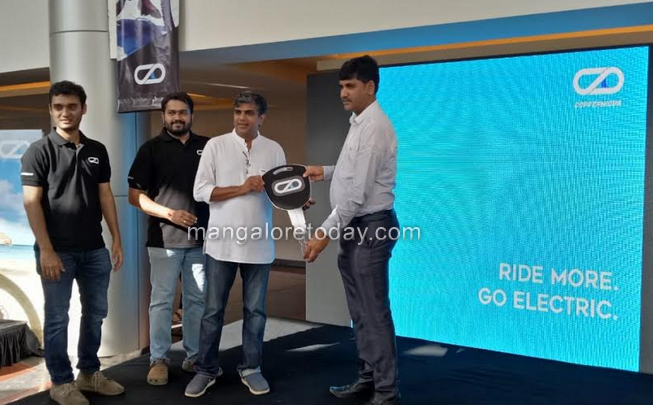 Mangaluru, Sep 12 2018: Coppernicus, an Indian motor vehicle brand which designs and manufactures electric vehicles, has launched its first premium segment e-bike Coppernicus T3, in Mangalore. Built tough and backed by some of the biggest and most respected names in the industry, there is no compromise on quality or ride experience. Coppernicus is on a mission to redefine the way we commute and aspires to help you make a positive lifestyle change - one that is oriented towards fitness and well-being. Coppernicus is launching 3 models with a range of 30 to 100 Kms and a price tag between Rs.40,000.00 and Rs.1.28 Lakhs. The top of the line T3 model will be competitively priced about 50% lower than imported bikes with similar specifications. The bike is powered by a 250W motor from Bafang – one of the world leaders in brushless motors. It has a max speed of 25 KMPH and a 14 Ah Lithium Ion Battery Pack as its power train. The T3 flaunts some of the world’s best components like the Shimano Zee gears with a 10 speed cassette from Japan which also includes a clutch system that provides smooth riding even on rough terrain. Designed specifically for the Indian market, the Bike rides with ease on city roads as well as rough terrain. While pedaling, the E-bikes have sensors that will assist your ride by supplying the required power from the motors as per your settings. It can also cruise without pedaling - for which a separate accelerator is provided. A color LCD display provides the rider with information like battery life, speed and other settings. Coppernicus is also launching a foldable e-bike with a range of 30 Kms which you can carry in your car for recreational purpose while going on long vacations to scenic places and hill stations. Pre-booking of orders is open and should be available in December 2018. The push towards a greener environment and the smart city project of the Government will be a catalyst for the use of e-bikes in the country says Kevin Vas, the CEO of Coppernicus. The bike can be serviced at any bicycle showroom. For additional maintenance support, Coppernicus is working a format to service your bicycle at home in different cities. In the first phase, Coppernicus will make its products available in cities like Bangalore, Mumbai, Kochi, Chennai and Ahmedabad through our dealer network and once stabilized, will be pushing sales through online sales platforms for which Coppernicus has already signed up with Amazon and ChoosemyBicycle.com, one of the largest online bicycle retailers in India where bicycles will be delivered to customers and fully assembled by at their homes. 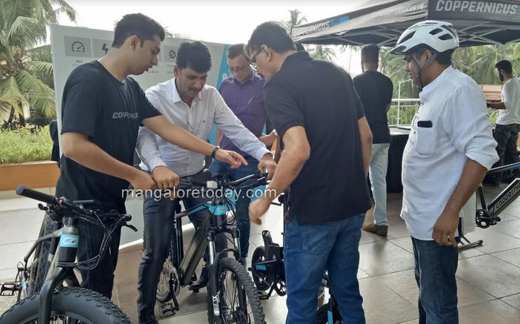 In Mangalore, Coppernicus E-bikes are available with Jyoti Cycles, a name synonymous with bicycles and a leading distributor and dealer for bicycles for over 7 decades. It was founded in Vittala and later shifted to Mangalore. 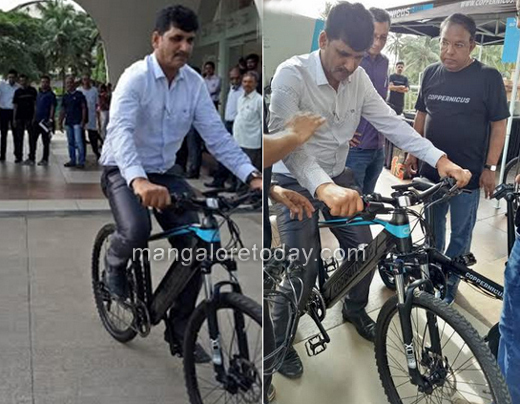 Jyoti Cycle has laid a strong foundation in its business by providing a wide range of good quality bicycles to Mangaloreans and uncompromising service. Jyoti Cycle has received awards for its significant contribution in developing a premium bicycle market space in Mangalore. Globally, e-cycles are a popular choice of the younger generation more than car ownership. India’s share in e-cycles is negligible but is slowly picking up. Coppernicus, headquartered in Bangalore, chose to launch its first product in Mangalore because it shares strong links with the city. The Founder of Coppernicus Mr.Kevin Vas hails from Mangalore. The product design and development team is from Mangalore, and has been relentlessly working and testing its products for the last 3 years. They plan to get more and more people to leave their cars behind and help you get on a bike - the perfect companion for mobility, fitness and recreation.